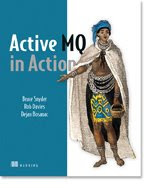 There's early access to some chapters from the book ActiveMQ in Action - on the Manning Early Access Program - MEAP. The book is aimed to be a practical guide to ActiveMQ, explaining the best practices for configuring brokers and clients, common gotchas - how many times do we need to explain that one ? ;) - broker persistence models, topologies, tuning, security and integration with containers such as JBoss, GlassFish and Geronimo.